Drywall Hanging, Finishing and Repair in Rensselaer, Indiana. Drywall Hanging, Finishing and Repair are common projects undertaken in many Indiana homes. Maybe you've just finished your basement and need to have the drywall finished and painted or maybe you've added a new addition, or finally decided to finish the garage. It's much more likely one of your kids has put their foot through the wall. With 26 years of experience RB Contracting has seen it all when it comes to drywall finishing and repair and we can certainly help you with your drywall projects. Cutting Out And Removal Of Destroyed Drywall. Putting An Appropriate Sized Piece Of Drywall In It's Place. Taping and Sanding Of ALL Seams. Painting To Match Your Finished Wall Color. When we are repairing drywall it's usually a good idea to paint the entire wall with the fresh paint rather than just the repair. This will make the wall look like it's never been touched! Taping and Sanding Where Required. 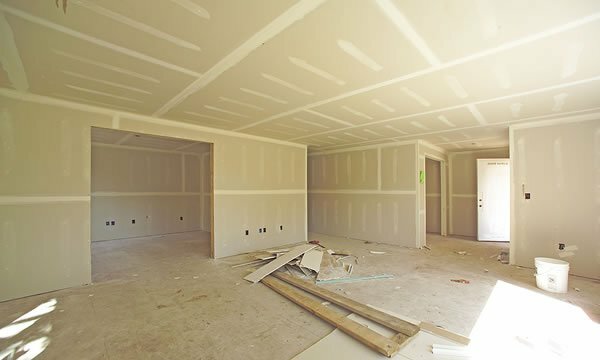 If you've got any Drywall finishing or repair work within your home or business give RB Contracting a call and we'll come out and give you a competitive estimate along with some friendly and helpful advice on your drywall project.